Eaton Vance Tax-Managed Dividend Equity Income Fund (ETY) is an actively managed closed end fund. The fund’s objective is to provide income exempt from Federal income tax and capital appreciation. This fund invests mainly in dividend paying common stocks and through utilizing an options strategy. 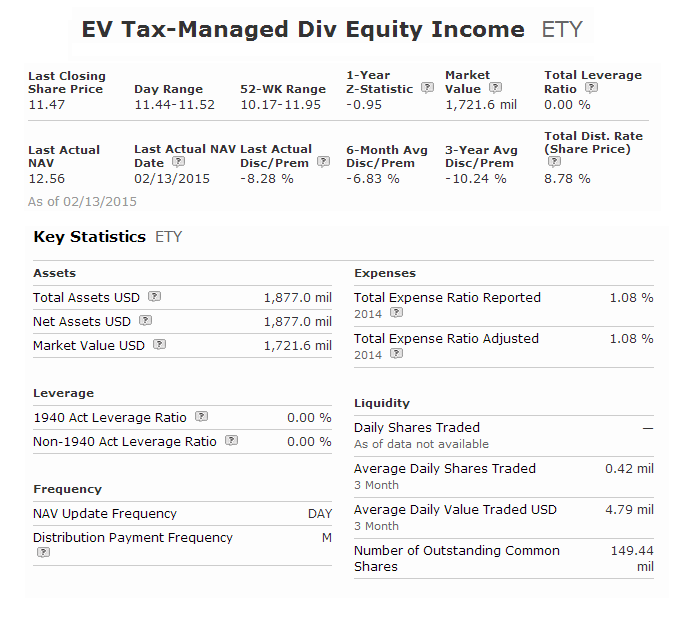 EV Tax-Managed Dividend Equity Income Fund is managed by team of Eaton Vance Management. This popular closed end fund has a high yield of 8.80%. This closed end fund has total annual expense ratio fee of 1.08%. The current share price is $11.52. This ETY fund has 65 holdings in its portfolio. Top 5 stocks in its assets are Apple, Inc., Google Inc, Altria Group Inc., Amazon.com Inc, and Merck & Co Inc. The expense fee is average. Will REIT Stocks Soar in 2015?